We spent 30 hours researching and testing out 15 different types and brands of swimming pool floats and found that durability, easy inflation, and features were the most important factors that consumers looked for when shopping. The Kelsyus Chaise Lounger scored high about the rest in all categories and is our top pick. This comfortable, fabric covered pool float has an integrated foot rest, cup holder, and backrest for the ultimate in pool comfort. The weight capacity of this comfortable float is 250 pounds. The mesh backrest and the jet valves make this a convenient, easy to set up lounger that you will love hanging out in on hot summer days. There’s no better way to spend a hot summer day than to float lazily around the pool on a comfortable pool float. There are tons of different styles, colors, and materials to please every member of the family from the youngest to the oldest. With all of these choices available, it’s easy to get overwhelmed when it comes time to buy one. We have provided you with the necessary tools you need to learn about what is available and how to choose a quality swimming pool float so you can relax in style whether you have your own pool or you are looking for something you can use on vacation. The three top-rated swimming pool floats below are popular with consumers for many reasons. The reviews we have added for you on these quality floats will give you more detailed information on them so you can see if one of them will fit your needs and preferences. We have also added a buying guide below with information on the features to look for and how to shop for a quality pool float that will be everything you are hoping for. 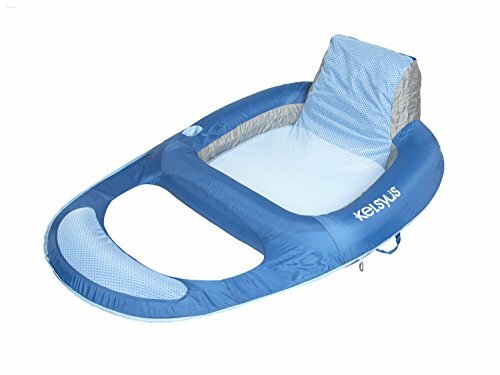 This ultimate pool float by Kelsyus will provide you with hours of relaxation and comfort even on the hottest days. The fabric covering is comfortable to lie on and the integrated footrest and backrest will have you struggling to keep from dozing off as you float lazily around the pool. The mesh seat holds your lower body just below the surface of the water which will keep you nice and cool when the sun is beating down and the temperatures are rising. Additional mesh is on the backrest so you stay cool no matter how hot it gets. Weight capacity of the Kelsyus pool float is 250 pounds. Don’t forget to grab your drink that you can keep in the integrated drink holder with ease. Intex is a well-known name in the pool industry, known for its quality pools and accessories. This stylish and functional recliner lounge for the pool will give you plenty to relax about. The reclining design allows for users to sit in the lounge chair and enjoy a drink without worry of spilling it into the pool. Once fully inflated, if you follow directions, the float is in someone’s yard. The Intex floating recliner has heavy duty 18 gauge vinyl that will stand the test of time. Have your drink right there next to you thanks to two cup holders that are built right into the float. Weight capacity is 280 pounds. If you’re looking for a quality pool float that will last years, this is one that you should consider. This amazing swimming pool float offers users 4 different ways that they can enjoy it: the hammock, the exercise saddle, the lounge, and the drifter. Each sitting style can be set up quickly and easily so you can exercise, relax, socialize or even take a cat nap comfortably. The coolweave fabric is comfortable to lie on and stays cooler than some of the other materials that are used for pool floats. It conforms to your body for the ultimate in comfort. The duo-lock inflation system means fast inflating and deflating so you’re not waiting around for what feels like hours while it inflates. Weight capacity of the 4-in-1 is 250 pounds and it is recommended for ages 15 and up. The footrest and headrest add to the comfort of this float and can be removed if you don’t want them. Taking the 4-in-1 with you to the beach, the public pool, or on vacation is easy thanks to the compact design that folds up super small. The three top rated pool floats that we have featured above are all high quality floats that provide comfort, durability, and style to your lazy summer days floating around on the water. All three models are made from premium materials for maximum longevity. Taking the time to be prepared for lounging around the pool on a hot summer day allows you to truly enjoy the benefits of a pool and what they can provide. With the right swimming pool float on hand, you will certainly lose track of time as you float around the water. Pool floats are very popular for family gatherings and having friends over. Purchasing a few for the guests and family members to use is a great way to share the comfort and relaxation of your pool with family and friends. If none of the three top rated swimming pool floats we have featured are what you were looking for, we have listed 7 other good quality pool floats for you to consider. There are several different types of pool floats on the market today. Selecting a few for your pool can be difficult if you don’t know what to look for and the features they can offer. We have provided you with some beneficial information that will help you get to know swimming pool floats a little more so you can confidently choose the right one or ones for your pool. Classic Style – The classic pool float allows the user to lie on them, flat on the water, and just relax as relax. The classic pool float can be made from mesh, foam, or be inflatable. Keep in mind that mesh styles will involve you being a little bit beneath the surface of the water. Family Style – Family floats are pretty impressive the first time you see one. A family float allows you to seat multiple people on the same float. They are much larger than a standard float to allow for everyone you want to take with you. Most family style floats have built-in seats that allow all the users to sit in a circle face the center. 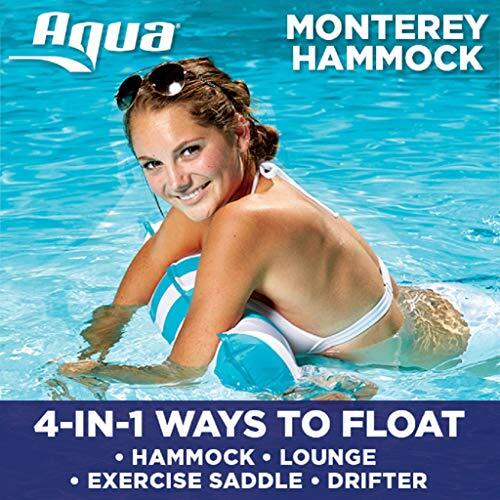 These are great for socializing while you enjoy floating on the water. Side by Side Style – This fun size can hold two people that want to sit in the same float. With side by sides the users will face each other or sit facing forward the same direction. Fun Style – Fun floats are great for kids or for those who are kids at heart. Fun floats are available in many different shapes including pizza slices, animals, fruit, and numerous other designs. They are colorful and lots of fun to look at as well as ride on. There are several features that you want to look for before you decide on a particular pool float. We have listed these common features below. Cup Holders – Being able to sit on a float and relax while having your drink right at your fingertips is the ultimate in luxury for many. You don’t want to have to always be holding your cup or can so having these hands-free cup holders built into the floats is a convenience few want to pass by. Portable – If you like to take your floats with you when you go on vacation you want to find a float or two that will fold up small and fit easily in your luggage. Look for a lightweight design that can be deflated quickly and easily so you can take it with you wherever you want to go. Look for designs that advertise that they are simple to inflate and deflate. Air Chambers – Look for swimming pool floats that have multiple air chambers. This makes a great safety precaution. Dual chambered pool floats have to be deflated in stages which can take several minutes more but the extras are well worth it. If one of the chambers pops while you are way out on the lake you will still be able to get off the lake and to safety. Materials – A pool float for an adult needs to be of better quality and durability due to the added weight the clothing straight to the kids’ rooms. Kids’ floats are usually made of thin plastic and will come in a variety of colors and shapes. Don’t forget to get a pool that offers a repair patch kit. This will enable you to repair any potential puncture quickly before it becomes a major issue that will affect the use of the float. Support – Swimming pool floats were originally designed for children so you want to make sure that the floats support an adult. Many companies are making pool floats sturdier and more durable and able to handle weights as much as 250 pounds or more. Don’t forget to purchase a float that comes with a patch repair kit or purchase one separately. Doing this will extend the life of your pool float significantly. Being able to fix a small puncture right away will allow you to play and use your pool floats easily without worry that you will have to repeatedly repair them. Set Up – One of the most important things to think about in regards to purchasing a pool float is the amount of effort and time it takes to pump it up and have it ready for use. Trying to use the air from your lungs can be really exhausting not to mention taking a long time. Look for pool floats that can be inflated easily and quickly so you don’t waste valuable relaxation time trying to get it inflated properly. Foam floats will not have this issue at all so if you are looking for a float that requires very little in the way of maintenance, foam might be the way to go. Comfort – Every pool float is not designed with comfort in mind but if you are purchasing one because you envision yourself lazily floating around the pool then comfort is going to be an issue. Who you are purchasing the float for plays a large part in whether comfort will be an issue or not. Children are not interested in relaxation they are interested in fun, so if you are purchasing a pool float for a child, look for the designs that are fun and interactive. It can be difficult to figure out whether a float is comfortable or not from just looking at it but you can look at the customer comments to get a better idea of what others think of the float to see if it will work for your relaxation needs. Durability – How long your pool float will last is also very important. No one wants to purchase a float only to have to purchase another one soon after. 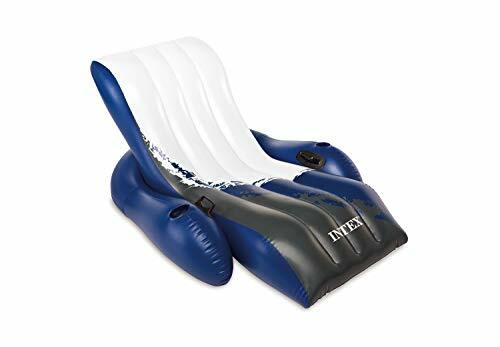 Inflatables are prone to getting damaged and punctured but if you spend the money for a higher quality float and don’t go for the cheap ones, you can still get longevity out of it, especially if you get one of the floats that are made from thick, vinyl like material that is more durable. Some of the inflatable pool floats come with patch repair kits which will extend their life further. While foam does not require patch kits and will last longer, it is not as comfortable to float around in as one of the inflatable styles. Buoyancy – This may not be the first thing you think about when it comes to a pool float but is should be up there in your consideration list. The buoyancy of your pool float will depend largely on the quality. Some floats are made to hold a lot more weight so they are made of thicker material that will hold more air. You may want to consider a more supportive float for kids as well if you keep in mind how hard kids can be on things when they are having fun. Look for more supportive buoyant floats if you are super tall or if you are overweight as well. Versatility – Do you want to be able to use your pool float somewhere else than just the pool? Some people like to bring pool floats to the beach or lake. This is another reason to opt for the higher quality, more durable floats. Not all floats are good for traveling but you can find some that still travel and store well enough to become mobile. It doesn’t matter if you are a kid or just a kid at heart, almost everyone who loves playing or swimming in a pool loves relaxing on a comfortable, supportive pool float. The three top rated pool floats that we have featured above as well as the alternates we provided are all higher quality pool floats that are made to withstand heavy use. Having the right pool float can make a big difference in the quality of your pool relaxation so take the time to assess your own needs and figure out what you are looking for. Once you have done that you will have a good idea of what you need to fulfill those needs and preferences. The buying guide information we have given you will take the confusion and overwhelming feeling out of the purchasing process and will allow you to sort through all of the different styles and choices to eliminate the ones that are not the right style, not durable enough, or not the right budget. Having the right knowledge will make a big difference in the experience you have while shopping. No one likes to purchase a product only to be disappointed upon its arrival. The right preliminary work, like reading this review and buying guide, will take the guesswork out and put you in control of the outcome. While you could still end up with a pool float that isn’t what you thought it would be, if you understand the features floats come with and which materials are more durable, this becomes a lot less likely to happen. Happy Floating!